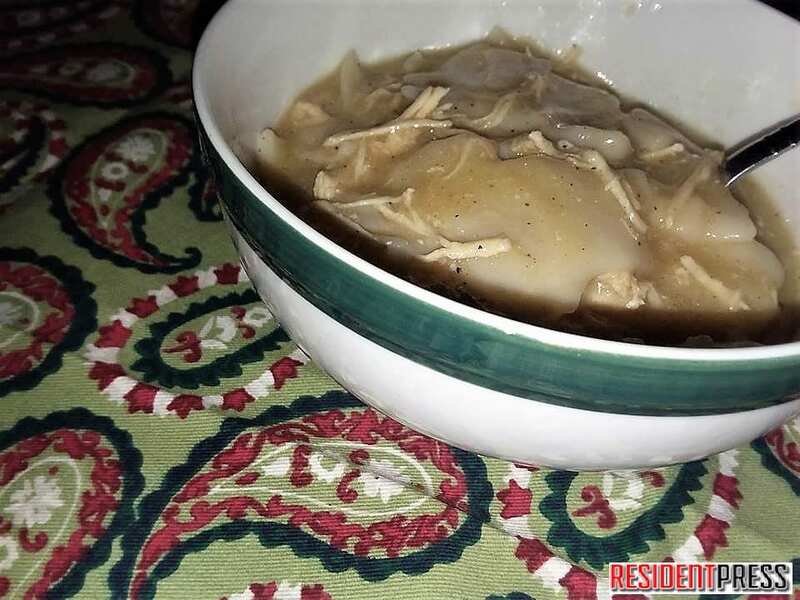 Mamaw's Chicken and Dumplings will sure solve any cravings for warm comfort food! 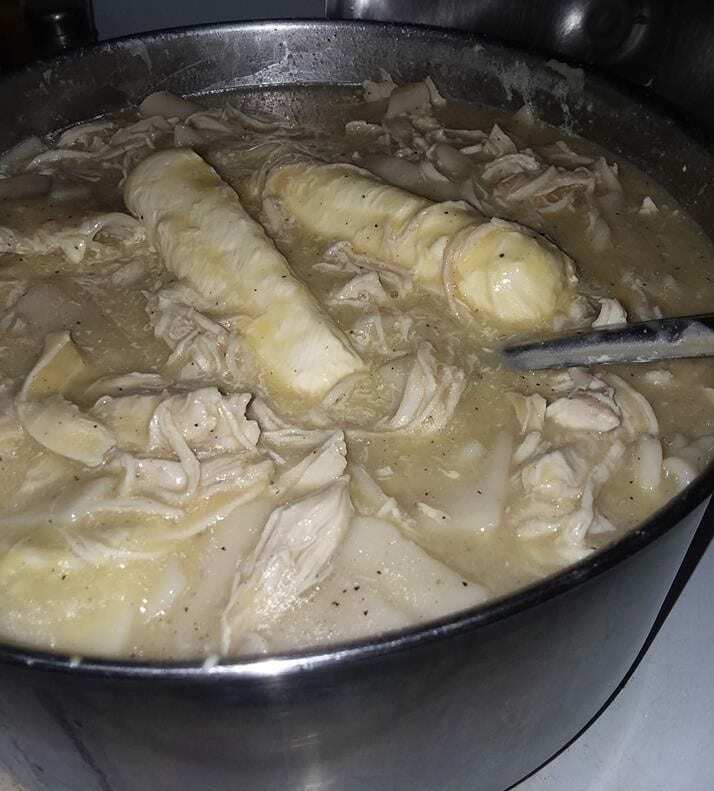 When my husband and I first got married, one night he requested chicken and dumplings for dinner. Being young and clueless on cooking, I knew I had better call his mother to get the recipe right! She told me that her mother had passed on the recipe to her for chicken and dumplings as well! Now, as the years have passed by, this has become one of our family’s favorite warm comfort foods on a cold winter day! With ball games and busy schedules, I have never had the time to make homemade dumplings. I know a lot of people make them from scratch and that is absolutely amazing. However, I have found that we love Mary B’s Dumplings in the frozen section at CV’s or Wal-Mart. They are a fast and easy solution! Within the ingredients, I have included a picture of the package of the dumplings to make it easier to find them! Fill a large pot with water and place four chicken breasts into the water. Place on high heat, and bring water to a boil. Once water has came to a rolling boil, now bring the temperature back down to a medium heat, and continuing boiling the chicken. Never let your pot run out of water while boiling or it will scorch the bottom of your pot. Boil the four chicken breasts until fully cooked. This takes approximately 45 minutes to an hour. You may have to add more water during the cooking process if your water level becomes too low due to evaporation of the liquid from the heat. Once the chicken is fully cooked and no longer pink, remove the pot from the burner. The water you have boiled your chicken in has now became part of the broth you will need for the dumplings so do not discard this! You will need it for later in the dumplings. Now, carefully remove the breasts from broth filled pot. Debone chicken meat from the bones. Dispose of bones, and set meat aside. Open the package of frozen dumplings and begin breaking them into thirds. Next, add two cans of chicken broth to the broth already in the pot. Take the pot back to the burner and bring the broth to a boil. Once the broth is at a rolling boil, slowly begin to add the dumplings into the boiling broth. You may need to use a fork to help the dumplings to not stick together. Once all dumplings are dropped in, turn heat to low, cover the pot with a lid, and simmer now for 45 minutes. Stir about every ten minutes to prevent sticking. 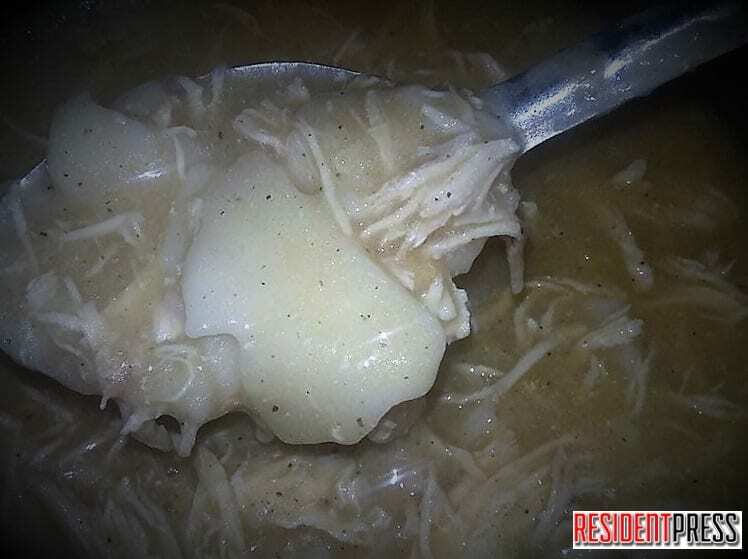 Once the dumplings are soft and cooked for 45 minutes, you will now need to add the shredded chicken, the can of cream of chicken soup, and the two sticks of butter. Adding butter to the Chicken and Dumplings! Next, add 2 tablespoons of pepper and 1 teaspoon of salt. Stir. Bring Chicken and Dumplings back to a boil on medium heat with continuous stirring until butter is melted and soup is mixed well. Once all is mixed, return to low heat and serve when ready! If you do not wish to use the frozen dumplings, canned biscuits pinched up in small pieces or strips of tortillas will work just as well for dumplings. Many people make homemade dumplings, but I rarely find the time to be able to make mine homemade and I have found my family loves it all the same, especially using the frozen dumplings. Enjoy!